Do you smell what The Rock is cooking? Apparently, it might be a Presidential run in 2020. Dewayne "The Rock" Johnson is pretty unanimously agreed upon to be an all-around great guy. Forbes recently named him the highest paid actor of 2016, which is a pretty big deal. His 2016 earnings were totaled to $64.5 MILLION and that's a whopping double what it was in 2015. To say he's continuing to rise at the speed of light would hardly be an exaggeration. I believe in our national security to the core, but I don’t believe in a ‘ban’ that bans immigrants. I believe in inclusion. Our country was built on that, and it continues to be made strong by that. And the decision felt like a snap judgment. The GQ interview was a real eye opener but that is not the only place The Rock has talked Presidential jargon. Just recently he appeared on Jimmy Fallon's Tonight Show and even there he hinted at a potential bid for the President. Of course, late night talk shows are notorious for playful banter between guests and hosts so we definitely have to look at the big picture and that's how frequently The Rock has talked politics. I feel like I'm in a position now where my word carries a lot of weight and influence, which of course is why they want the endorsement. But I also have a tremendous amount of respect for the process and felt like if I did share my political views publicly, a few things would happen—and these are all conversations I have with myself, in the gym at four o'clock in the morning—I felt like it would either (a) make people unhappy with the thought of whatever my political view was. And, also, it might sway an opinion, which I didn't want to do. 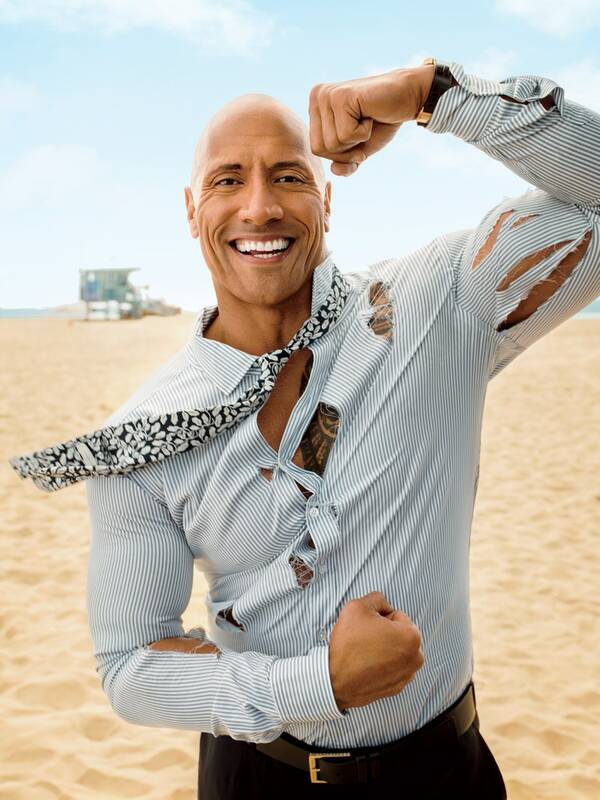 So, even after teasing with Jimmy Fallon that 3 years can bring a lot of change, aren't you dying to know what is officially holding back the epic Presidential campaign of Dewayne "The Rock" Johnson? We were, too. 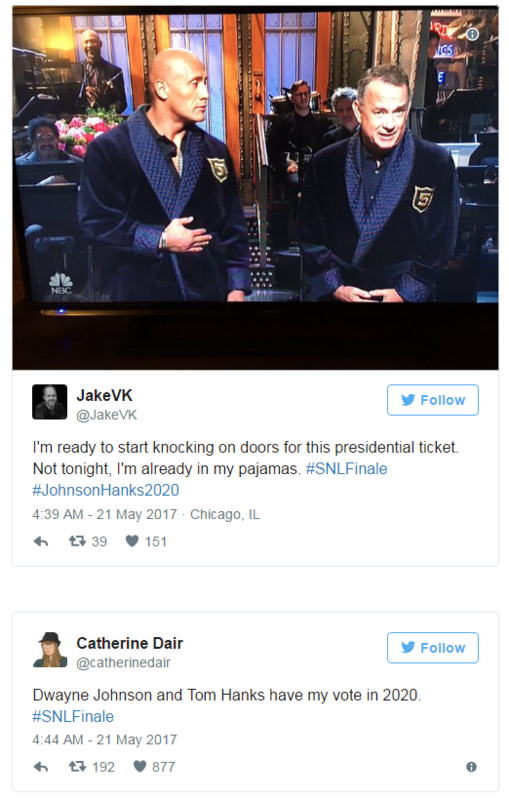 Thankfully a recent appearance on Saturday Night Live gave us a whopping hint. With his epic 5th appearance on Saturday Night Live, Dewayne "The Rock" Johnson dropped the bombshell we've been dying for during his opening monologue: the show marked the official start of his campaign. And then it got better! 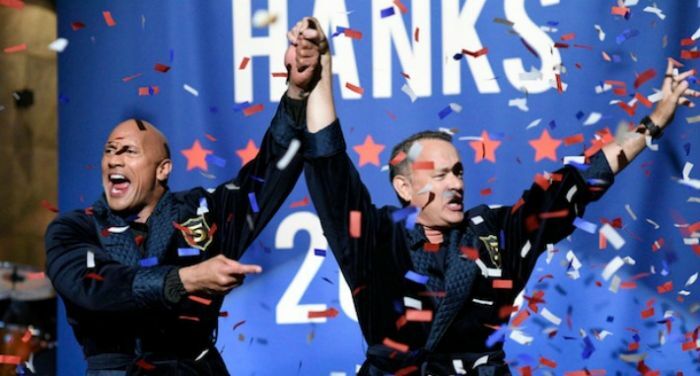 He announced his running mate, none other than the one and only Oscar-winning actor and male-equivalent of American Sweetheart: Tom Hanks. Dwayne, Dwayne, Dwayne, I could not possibly… turn this down! I’ll do it! ...fought in World War II in, like, 10 different movies. ...the minority vote because everyone just assumes that I’m, well, whatever they are. And of course the Internet immediately went ablaze with excitement as posts on Twitter began to uproar. OK, so it's SNL and we aren't entirely sure if it was all in jest or if there's even a chance of truth... but one thing is for certain: we freaking love The Rock. Barack Obama and his wife Michelle Obama were absolutely gold and something America totally misses. Scratch that, the whole world was affected by the positive power couple and is now suffering that loss! When Obama was still president, a woman invited the power couple to her wedding. She didn't expect a reply but was pleasantly surprised and turned to social media with her experience!